First off, the good news. These little Altos give quite a thump. OK, no-one expects to get the same depth of bass from a 12″ sub that you get from bigger 15″ or 18″ subs – that would just be silly – but the 12″ speaker in the Alto gets surprisingly loud. I’d say almost as loud as a few higher end 12″ subs I’ve used, and most definitely louder than most similarly priced budget 12″ subs. The problem though is that the Alto’s are essentially budget subs and with budget subs you tend to get what you pay for. After a few months of use one of the 12″ speakers blew. To be fair, this can happen with any speaker, especially bass subs, but Pat and I both feel the electronics inside the speaker should have provided a little bit better protection and the limiter should have kicked in before it got to the point of blowing the speaker. Then, a couple of weeks ago, the other sub developed a different problem. While carrying it in and out of the gig, Pat could hear this loud rattle coming from inside. Upon opening it up, we found the internal port/vent had broken off and detached itself. On higher end speakers, the port/vent is usually made of a strong plastic composite type of material but the port/vent inside the Alto is made of cardboard. A bit of strong glue was all it took to stick the port/vent back in place, but how long it will last before it breaks off again is anybody guess. I don’t want to sound too negative about the Alto TS212S subs. At the price point they are retailing for right now they definitely look to be great value compared to other 12″ subs. But you need to be aware that this great price is achieved by using lesser quality components, Whether these subs are worth it to you is something you will have to personally think about and decide for yourself. If you’re doing small gigs where you don’t need a lot of loud bass such as coffee shops, guitar/vocalist acoustic sets, or small lounge bars, you probably can’t go wrong with the Alto’s. They will add a nice bottom end to a couple of 10″+horn or 12″+horn tops. But if you play gigs where you regularly need the bass to kick out loudly, you may want to think carefully before purchasing these subs. Don’t get me wrong, the Alto’s will still deliver loud bass when you ask them to. The question is how reliably they can do it if you intend to run them reasonably hard on a regular basis. 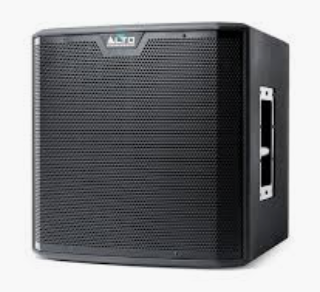 In conclusion, if you do smaller/quieter types of gigs I would fully expect you to get a couple of years – hey, maybe even a few years – of regular use out of the Alto’s without any reliability problems and you certainly can’t complain at that, especially considering the insanely inexpensive price of these subwoofers. But if like Pat and I, you play regular loud(ish) gigs you may find they’re not just quite up to the job and won’t sustain this type of use without something failing. In cases like this you may be better off biting the bullet and paying twice the price for a pair of high end subwoofers with better quality components. Don’t let this review put you off buying the Alto TS212S. Many bands and entertainers have been using these boxes with no problems whatsoever and are more than happy with their purchase. Just be aware that there may be a price vs quality aspect to be considered before you buy depending on how you intend to use them. It’s always good to remember that when buying any speaker it’s more important to buy the one that’s right for the job rather than one that’s right for your pocket. Anything else can be false economy.